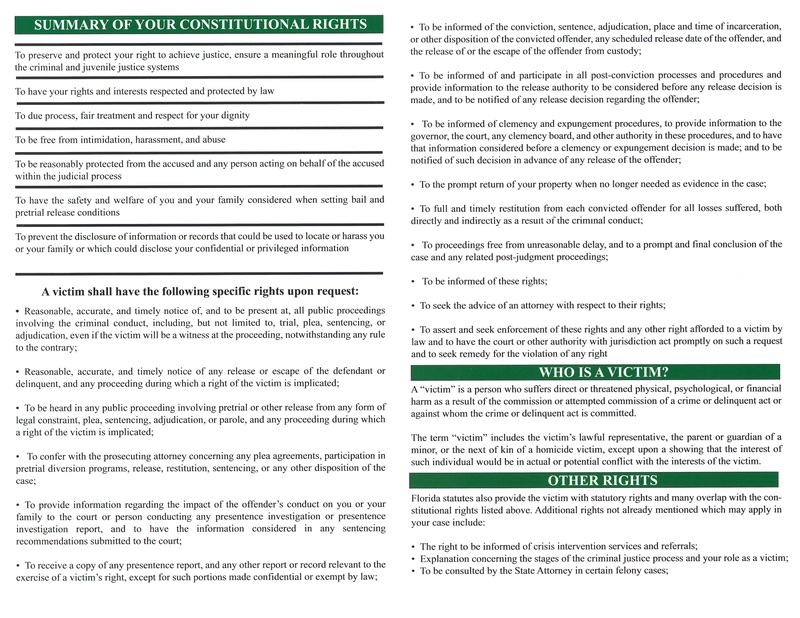 When citizens become invovled with law enforcement, the court system or other agencies as a victim, they may need assistance, dealing with a variety of emotions or have questions regarding the process. Our office has a Victim Services program to help with short-term crisis intervention, referrals to community agencies and with filing victim compensation claims. Services are provided 24 hours a day, 7 days a week. Call us at (407) 665-6650. An arrested accused is seen by a judge within 24 to 48 hours at a court proceeding known as First Appearance, provided the accused has not posted bond and already been released. Initial bond amounts are pursuant to a bond schedule set by Administrative Order. All First Appearance hearings are held at the John E. Polk Correctional Facility at 211 Eslinger Way, Sanford, Florida in courtroom J-2. These hearings are held on normal court work days at 2:00 p.m. During court holidays and on weekends, these hearings are held at 9:00 a.m. To confirm the date and time of an accused's first appearance please log on to www.seminolesheriff.org/WebBond/Inmates.aspx and see heading Court Date. Future court dates can also be found by accessing the Clerk of the Court's website at: www.seminoleclerk.org. 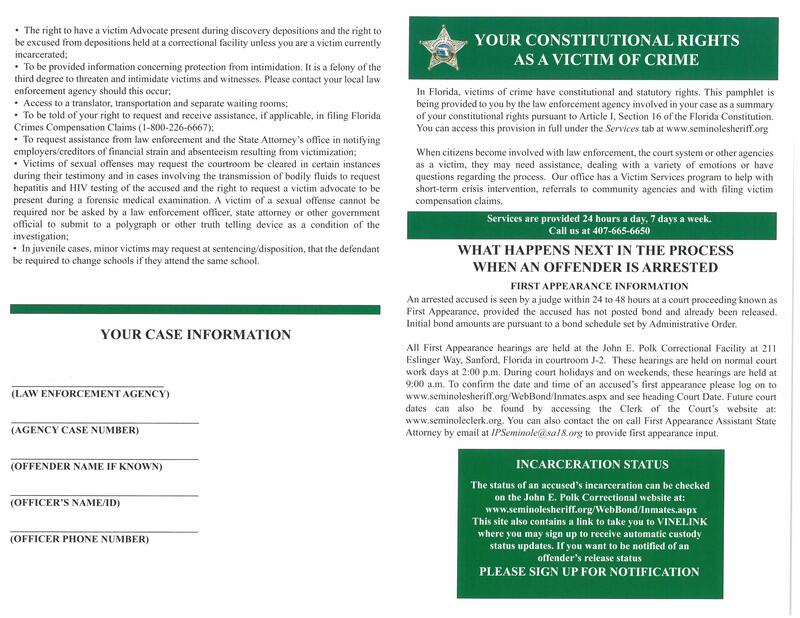 You can also contact the on call First Appearance State Attorney by e-mail at IPSeminole@sa18.org to provide first appearance input. The status of an accused's incarceration can be checked on the John E. Polk Correctional Facility website at: www.seminolesheriff.org/WebBond/Inmates.aspx. This site also contains a link to take you to VINELINK where you may sign up to receive automatic custody status updates. If you want to be notified of an offender's release status, please sign up for notification. A "victim" is a person who suffers direct or threatened physical, psychological, or financial harm as a result of the commission or attempted commission of a crime or delinquent act or against whom the crime or delinquent act is committed. The term "victim" includes the victim's lawful representative, the parent or guardian of a minor, or the next of kin of a homicide victim, except upon a showing that the interest of such individual would be in actual or potential conflict with the interests of the victim. In juvenile cases, minor victims may request at sentencing/disposition, that the defendant be required to change schools if they attend the same school.